There is always a story behind the design– ALWAYS!… even with clients…. there are often hours of thoughtful colour, material, design planning and many inspirations to create an excellent customized design project. This little table is no exception, it has been with us for many years and…. has been just a few colours…. that’s all I will confess! It’s such an easy little project to quickly sand, prime (sometimes) and repaint for a fresh look when glitter paint splatter, little finger prints, bits of dried smoothie & crayon gets a bit too wild! It’s time for a fast and budget friendly makeover! Recently, I am GREEN CraZy…. amongst a few other intense colour obsessions- but that’s another story…! This funny little table sits right in my living room and in March– I couldn’t take all the ‘kaka’ weather…. The Gloves are Off! so to speak. 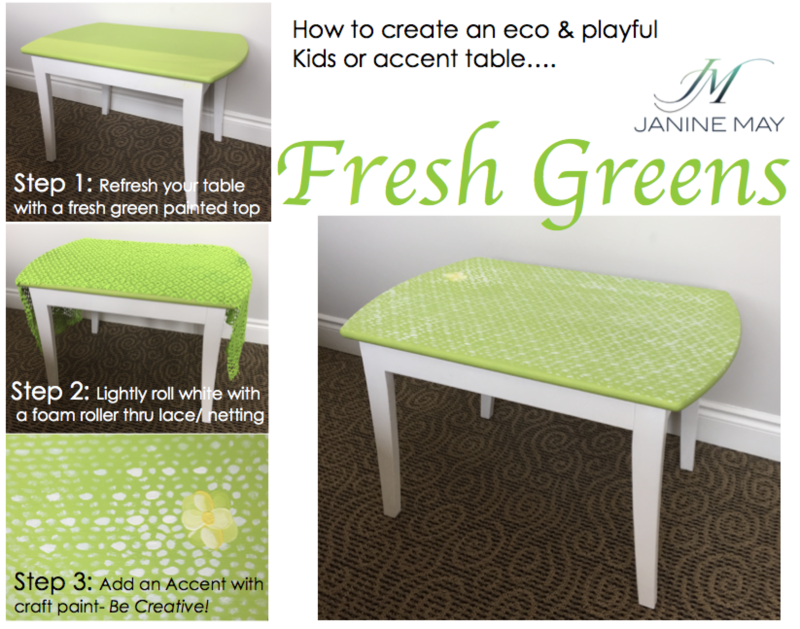 I needed to feel SPRING ‘picnic weather’- so GREEN the little accent table became! Sanded and quickly cleaned up, rolled on a few coats of a bright lime green for fun, let it dry for a day. Taking this project one step further as I was touching up the legs with a warm white, I rolled over a piece of modern lacy fabric, which revealed the look of an imperfect vintage table cloth- adding a finishing touch of a small painted flower by craft brush. The nature inspired table appears to be a spring picnic table complete with a Zest of Lime! Your whole family will love it…. ! Have fun & paint on my friends!